Aha, 8 mono WAVs won't be recognised as being multiple channels, I believe. You need to render them into a multichannel WAV which will interleave the samples for all 8 channels at the same point in time. I can't recommend any software but a search for 7.1 channel audio editor freeware produces results such as n-Track Studio - just watch out for those annoyance-ware download managers and toolbar installers. That app claims to support multichannel WAV export, which should be just fine for providing to the Opus encoder and will tell it which channel is which. You might also wish to combine the LFE channel (the .1) into another channel, such as the centre channel - there's some guidance in the Opus pages, I believe. This is almost identical to my system and results. Maybe ICC is generating some Ivy Bridge specific optimizations? Either way, it's very interesting that the rarewares ICC SSE compile is 15% slower than the official release. Since it's neck-and-neck at this point anyway, I thought it wouldn't hurt to include yet another build -- this one is the latest (again) as of this post. May be slightly faster due to stack changes. I'm not aware of any normal encoder that accepts multiple input files to be mixed as one output file. It's an encoder, not a mixer. Plenty of options for that. Just one example: if you want to do the mixing from the command line, SoX ? ?combine merge should do that for you. A caveat, however: as far as I know, it doesn't currently have a way you can set the channel mask or a way to give explicit instructions about channel order. Instead, the channel order is just whatever order you specify your input files in, and the channel mask is whatever SoX thinks is the best guess given the number of channels you've input. It's quite possible that that works just fine for standard surround setups and only runs into trouble with exotic configurations; I don't have any surround files or equipment, so I don't really know. Thanks! I like to test speed by feeding the encoder a large series of streams (e.g. 50), or one very long concatenated stream, and measuring the time it takes to complete. I also updated my previous post with a slightly tweaked compile. My tests measure between 0.5-2% speed increase over 11_7b with my test corpus on Sandy Bridge. It now edges up over the official build at --bitrate 68 --framesize 60. It's still neck and neck at anything higher, though. Aha, 8 mono WAVs won't be recognised as being multiple channels, I believe. You need to render them into a multichannel WAV which will interleave the samples for all 8 channels at the same point in time. I don't want to mix channels, but interleave them, thinking that it would make the opusfile smaller than having 8 separate files. Only that http://opus-codec.org/docs/html_api-1.0.1/index.html says opus supports upp to 255 channels, but after reading http://msdn.microsoft.com/en-us/windows/ha...e/gg463006.aspx it seems that wav support max 18 channels. No problem for what I'm trying to do, but how to create 255 channels? Thanks for pointing me in the right direction! Found this: http://people.bath.ac.uk/masrwd/mctools.html will give it a try. When merging to WAV in both cases a WAVEFORMATEXTENSIBLE header will be created in which the channel order will be specified. I guess this has already been mentioned, but piping multichannel PCM is still bugged. avs2pipemod[info]: writing 25.500 seconds of 44100 Hz, 4 channel audio. avs2pipemod[info]: finished, wrote 25.500 seconds [100%]. avs2pipemod[info]: total elapsed time is 0.063 sec. avs2pipemod[info]: writing 60.000 seconds of 48000 Hz, 6 channel audio. Skipping chunk of type "
avs2pipemod[info]: finished, wrote 60.000 seconds [100%]. avs2pipemod[info]: total elapsed time is 3.547 sec. Extracting to WAV and feeding that to opusenc works just fine in both cases. If you need samples, just ask. opus_tools_11_8_2012_sse at top and opus tools release at bottom. This is with nothing open and the same settings as you guys. I just downloaded "opus_tools_11_8_2012_sse.zip" from up-thread. The commandline and the files it writes _claims_ that it is "libopus 1.0.1" but I decompiled the code and see that it's some random snapshot of our still fairly experimental 1.1 development branch. This stinks. It make it hard to deal with quality reports. You should not be running the pre-1.1. development code unless you're planning on performing some listening tests and reporting back your results. You certainly shouldn't be posting binaries that create files that claim to be 1.0.1 that aren't. configure.ac, as it is now, would require manual modification of version.mk in order to write something other than 1.0.1 unless git is used. windows users would probably download the gitweb snapshot and compile vanilla. that's not using git, and the snapshot from gitweb doesn't have the .git directory inside. so even with git present, git describe will not work. I guess people will have to adjust the version.mk whenever distributing a build, unless a better solution is around. where XXXXXXXX is an eight digit representation (seven digits might work) of the most recent git commit. the actual developers may have a better idea. From now on, version numbers of non-release builds will be properly reported as 1.1-gXXXXXXXX within the post, binary, filename, bitstream, "tool" tag, and included text file. I thought it wasn't much of a concern at the time because I was clear to specify in each post (the only place the downloads could be found) it was experimental, and the most recent HEAD as of post time. (After all, it was an exploration of program speeds and compilation optimizations across system and time, not intended specifically for quality tests). The filename also indicates the date of source, which happened to coincide with compilation (I kept everything up to date). I did not consider that the quality would also be evaluated independently (much less reported by users based on the binary's invalid time stamp, which itself is a result of the stock configuration script). My apologies. So here goes. 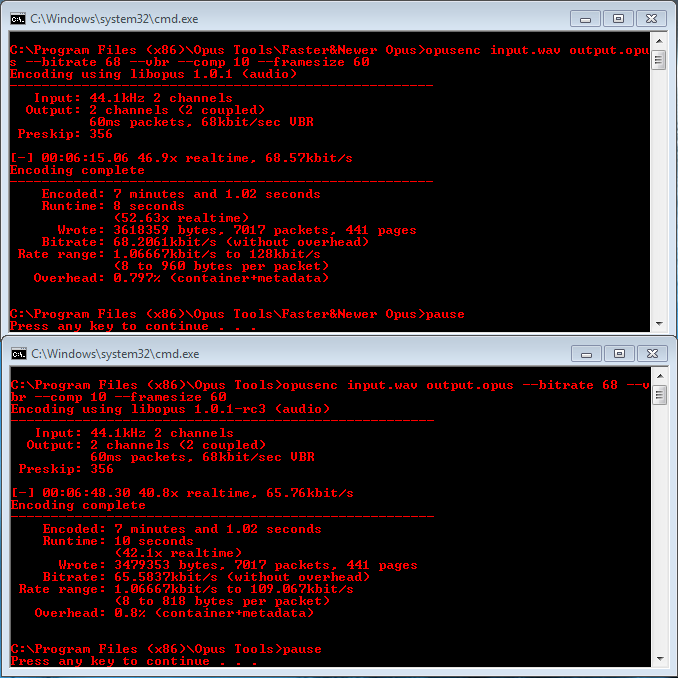 Latest git for both libopus (1.1.c55f4d8 2012-11-10) and opus-tools (0.15git 97a5c5f 2012-11-06) as of this post. Dates are also standardized format from now on (YYYY-MM-DD). Major changes include libopus bugfixes. Naive builders, particular on Windows without git installed, would get builds calling themselves 1.0.1 even though master has diverged significantly from the 1.0.x series at this point. We should update this file both before and after release. Acrobits added Opus to its list of codecs. This is a great news and an awesome way to test with iPhone and Android. Short verdict: opus (in both its 0.9.11 "opus" and 0.11.2 "CELT" form) wins against Apple AAC-LC (presumably 1.7.1, in both "true" and "constrained" VBR) at 75kbps, raking significantly above "3.0" with AAC-LC ranking significantly below 3.0. All codecs tie between 3.5 and 4.0 at 100kbps. This is a somewhat expected result. However, the standard error (distribution deviation) of Opus quality appears much greater than with Apple AAC-LC, which has relatively small error margins, especially at the higher bitrate. I'm curious about some features of the statistic distribution; is there a spreadsheet of the results anywhere? Also, latest HEAD/master for libopus (1.1.14454c4 2012-11-14) and opus-tools (0.15git d71e574 2012-11-14). The website says "Branch exp_analysis7 has experimental encoder perceptual tuning", but recently a lot of activity is in the exp_analysis branch (without any number in the name), while the exp_analysis7 seems to be abandoned (last change many weeks ago). So if I want to get the latest perceptual tuning, which branch is the "right" one? Has active development moved to exp_analysis or should I still stick with exp_analysis7? ea7 was merged into the master more than a month ago (commit), recent “exp_analysis” branch was created yesterday from the master. From that, I would assume that “active development moved to exp_analysis”. At this point, I think you probably want to track master. The stuff in exp_analysis isn't really interesting yet, and when it is, it'll soon get merged back into master. For the time being, I'm not expecting long-lived work to be done on a branch like happened with exp_analysis7 (and the previous versions). git describe --tags --match "v*"
; only if that fails does it fall back to version.mk, but if it works, it actually overwrites version.mk. Problem is, git HEAD is currently tagged as v1.0.1-151-gf92c87a, so you can see the difficulty for someone who actually uses git rather than downloading tarballs. If the git HEAD is retagged as 1.1 (-pre or whatever) that problem should be fixed. I'm going to temporarily remove genversion.sh and update manually instead. So, Opus will resample 44.1 kHz input to 48 kHz and also everything above 48 kHz gets down-sampled to 48 kHz, because "this simplifies the algorithm". According to the F.A.Q. the Opus decoder will output 48 KHz in that case. The F.A.Q. also says that it is recommended to keep the decoder's output at 48 kHz in order to avoid yet another resampling and because "many inexpensive audio interfaces have poor quality output for 44.1 kHz". Okay. But now I noticed that "opusdec" from the Opus Tools will automatically invoke the resampler to restore the original input rate (e.g. 44.1 kHz). Indeed there is a "--rate" switch to resample to a user-define sample rate, but I'm missing a "--no-resample" switch to avoid re-sampling altogether, ignore the original input rate and just output at the internal Opus sample rate (as the F.A.Q. suggests). Wouldn't adding such a switch to "opusdec" be desirable? Probably --rate 48000 will do the trick.